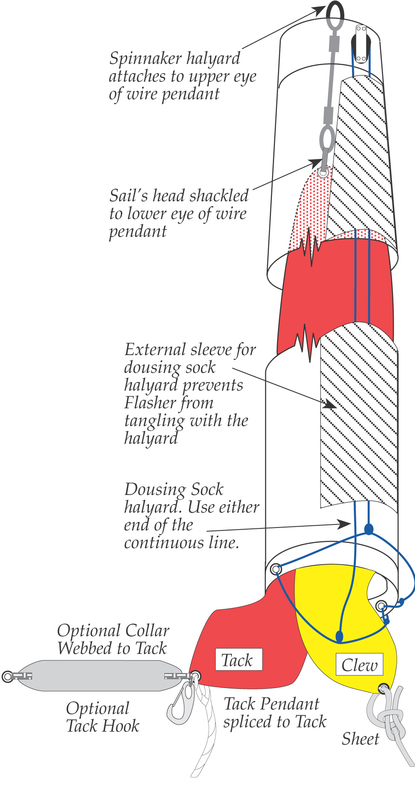 The dousing sock was designed to help shorthanded crew handle the cruising spinnaker or gennaker. The sock takes the place of several long-armed crew members by encasing the sail during sets and douses to keep the sail under control. In fact, this is the system that is used by the singlehanded around the world racers who set spinnakers on 60-footers by themselves. Above: When the cruising chute is flying, the dousing sock sits on top of the sail. Right: The internal dousing sock halyard cannot tangle with the sail since it runs through its own section of the sock. After hoisting your cruising spinnaker in the dousing sock, simply raise the sock and tie off the sock’s control line at the base of the mast. By pulling on the sock’s internal halyard, setting and dousing becomes a controlled maneuver. You’ll find you have more confidence in your cruising boat handling that you’ll use your gennaker more often. The dousing sock, also called the UK Sailmakers Stasher, is an inexpensive addition to your sail inventory that will make you ask yourself why you didn’t purchase one years ago. Note that you can order a Stasher with a hard fiberglass mouth or soft plastic mouth. We recommend that you order your Stasher without the hard fitting as the fiberglass mouth is heavy and could scratch your mast and the inside of your boat.